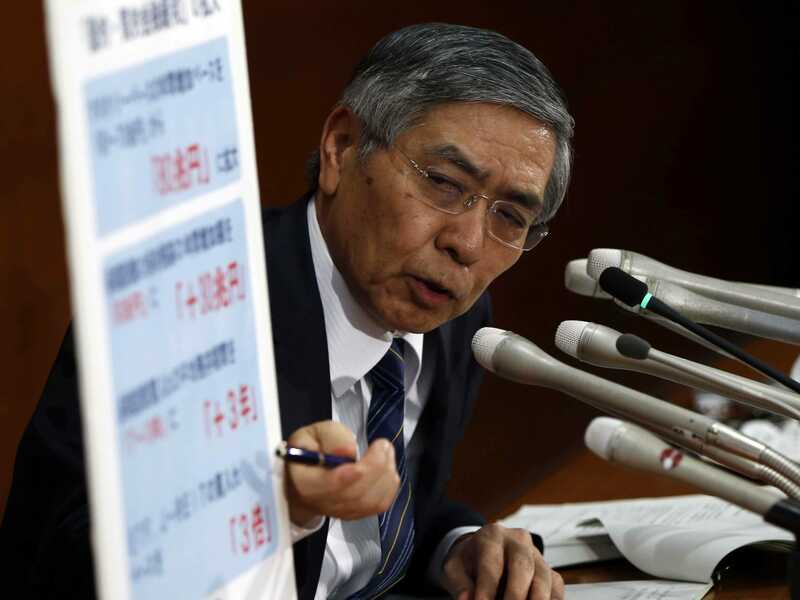 REUTERS/Issei KatoBank of Japan (BOJ) Governor Haruhiko Kuroda points to a placard showing BOJ policy decisions during a news conference at the BOJ headquarters in Tokyo October 31, 2014. 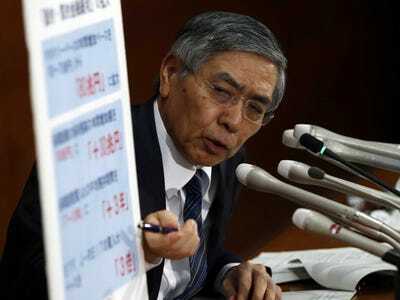 A big bundle of data on the Japanese economy came out Friday, with November’s inflation figure putting the Bank of Japan (BoJ) further away from its new 2% target. Stripping out the most volatile parts of the index, like food prices and the effect of April’s sales tax hike, inflation fell to 0.9%, as analysts expected. That’s the first time it’s been below 1% for more than a year, after BoJ governor Haruhiko Kuroda’s gargantuan new QE programme. Without stripping out the effects, Japanese inflation is still at 2.9%, but the effect of the tax hike will drop off sharply in April, a year after it was brought in. Japanese two-year bonds traded with negative yields in the aftermath of the news, a first for the country. That indicates that investors are expecting very little inflation or growth, so they’re willing to accept a small real-terms loss on their investment. A bundle of other economic news was slightly more positive for Japan: overall household spending dropped by 4% in the year to October, less than analysts expected. The unemployment rate also fell to 3.5%, a 16-year low. Industrial production rose 0.2% month-on-month in October, and retail sales are up 1.4% from the same month last year, both of which were better than economists expected. Overall it’s bad news for prime minister Shinzo Abe, who called a snap election to justifying stalling the second round of a sales tax increase which is blamed for halting the economy. With oil prices still putting downward pressure on inflation, it also suggests we could see a second round of Kuroda’s unexpected acceleration of QE if inflation falls any further.